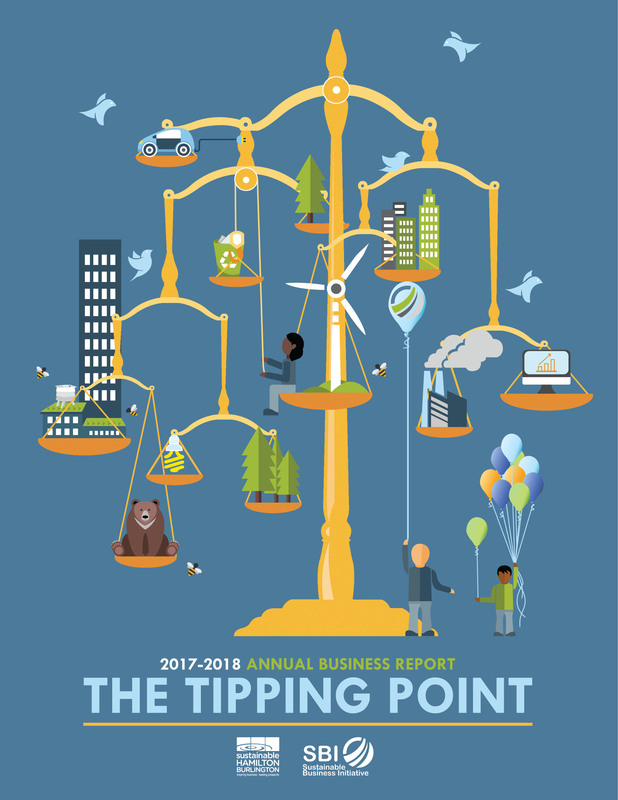 Sustainable Hamilton Burlington’s 2017-2018 Annual Business Report cover titled the Tipping Point. Image courtesy of Sustainable Hamilton Burlington. It can be easy to look at the negative side of our environmental situation at times. You may hear things like, “When will our atmosphere have so many greenhouse gases that our weather patterns are no longer predictable?” This is what is called a negative tipping point. What if instead of looking at the situation as a lost cause, we looked at a tipping point of hope? 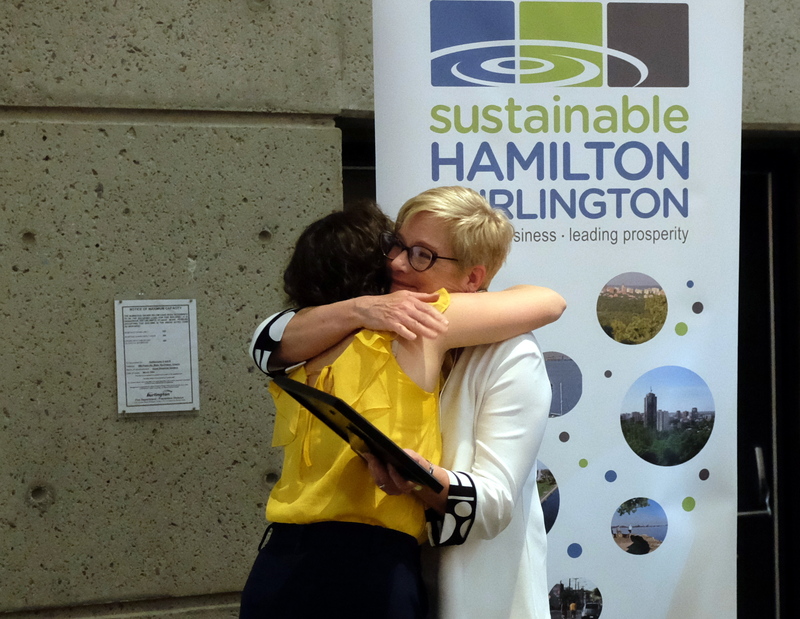 On May 29, Sustainable Hamilton Burlington hosted their sixth annual Evening of Recognition. This year’s theme was “The Tipping Point” and positive tipping points about our movement towards a better environment were highlighted throughout the evening. Who is Sustainable Hamilton Burlington? SHB is one of seven Green Economy Hubs across Ontario and together, they are showing us that a more sustainable economy is possible. What is the Evening of Recognition? The Evening of Recognition celebrates local businesses who are taking steps to reduce their carbon emissions and inspire others to be leaders in climate change. What are some of the tipping points that were highlighted? Between 2017 and 2018, SHB members increased by 40 per cent, and the City of Burlington and City of Hamilton were added to its membership. SHB partnered with the Centre for Climate Change Management. Green Economy Hubs have grown from three businesses to over 250 green economy leaders within the seven hubs, over the last decade. As of Dec. 31, 2016, businesses in the Green Economy Hubs have collectively reduced 44,257 tonnes of carbon dioxide equivalent which is like taking 9,477 cars off the road for a year. The evening ended with Sandi Stride, former president and founder of SHB and current executive director for the Centre for Climate Change Management at Mohawk, accepting a lifetime achievement award for her endless passion to encouraging others to reduce carbon emissions. Congratulations Sandi! Founder of SHB Sandi Stride accepting the Lifetime Achievement Award from Kim Gutt, Interim Executive Director of SHB. Image courtesy of Sustainable Hamilton Burlington. To view all SHB’s annual business reports, please visit https://sustainablehamiltonburlington.ca/report/. Take Action Burlington! Collectively we can inspire positive changes and make a difference.